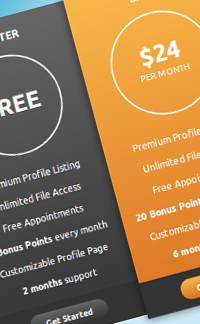 A sleek pricing table made using CSS3. CSS3 gradients have been used along with box-shadow and transform(scale) for the active/hover effect. The active(orange) style could also be used for a smooth hover effect. Works fine in Chrome for me, but not IE. How to add new price? I try it but it add to another line. How to remove the yellow color and hover effect of the middle layer Help!